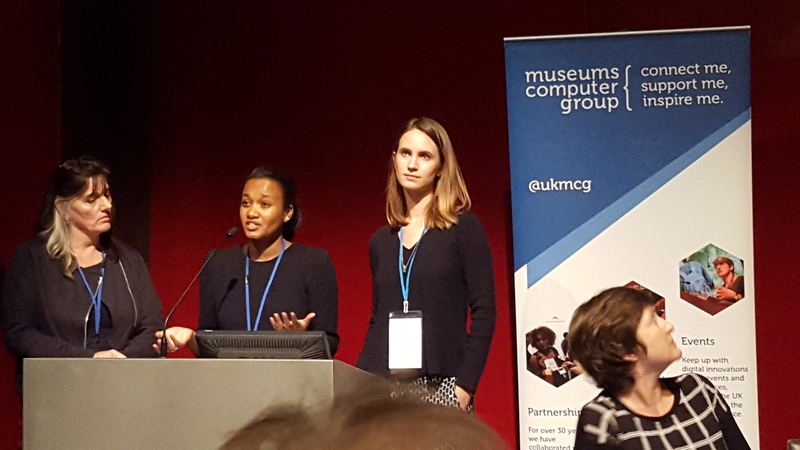 On Monday 26 October I started the work week by making my way into London and the British Museum for the annual Museums Computer Group Conference – UKMW15 Bridging Gaps, Making Connections. I have always been a big advocate of MCG and was extremely pleased to join the committee last year and get more involved. Their conferences are always a great opportunity to hear about some of the latest digital initiatives in UK museums and meet with colleagues from across the country we don’t see often enough. Plus I couldn’t miss this one as I convinced two of my colleagues to go and present on the Hidden Museum project that we are working on; I’ll share details of that project here soon. 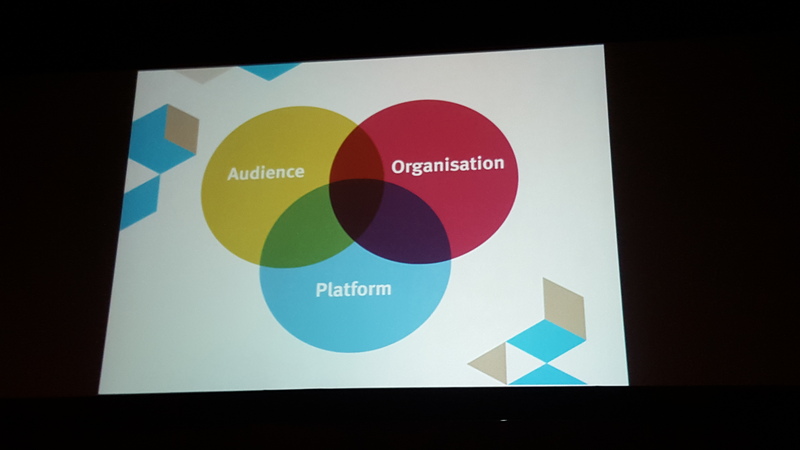 The theme of the conference was the new connections we can make with our collections, our audiences and our partners through digital, but also the gaps that this changing way of working can create. The first session of the day took on Connecting Content and was chaired by Shelley Mannion from the British Museum who I think does some fantastic work around developing mobile products for BM audiences. Looking forward to the release of the new BM multimedia guide she has been working on at the end of November. The highlight of the session for me was Cassie Williams from the Royal Institute talking about Building and audience on YouTube – lessons learned from managing the Royal Institution’s channel. To answer the question of why video was a vital channel, Cassie took us back to 1801 when the Royal Institution first wrote down one of their public lectures for dissemination. This evolved into sound recording, radio broadcasts and eventually TV – YouTube is the next frontier. Averaging 5m minute views a month, to achieve this they needed a clear idea of what success would look like. The Royal Institute also has their own channel, but the vast majority watch via YouTube, which brings great benefits (such as monetisation) but also challenges. YouTube users expect regular consistent content, which can be a challenge when juggling other commitments and priorities of the organisation. All the typical advice for vloggers won’t always work for organisations. For example, the suggestion for presenter led videos; this is hard for an organisation as key internal candidates are often very busy – and if they leave the organisation, what happens to that investment? Clearly the RI has had great success in developing their YouTube following, but their next challenge is to try and understand how this initiative is helping achieve the RI’s overall mission of improving engagement with and understanding of science. I look forward to hearing what they come up with. This session also included my colleagues Scott Billings, Digital Engagement Officer at the Oxford University Museum of Natural History and Public Engagement Officer at the Museum of the History of Science, and Ted Koterwas, Web and Mobile Development Team Lead in the Oxford IT Services department shared our project Hidden Museum: utilising digital to connect collections, content and people. I’m planning a blog about this project in the next few weeks so you can read about that soon. Then before lunch we also had a series of short lightning talks designed to provoke. It kicked off with Richard Light, a freelancer, talking about Museums, the home of unlinked data. His key message, it is not enough to look inward when cross referencing data, we need international standards to link collections across organisational boundaries. This is definitely something we are thinking about at Oxford, linking our own collections and making them internationally relevant – an exciting challenge. Another highlight was Russell Dornan from the Wellcome Collection with his talk Don’t cross the streams! How we broke all the rules with #MuseumInstaSwap. In the project Wellcome hooked up with ten other London museums popular on Instagram. The museums mixed up their streams, with the museums visiting the other museum spaces to get content for their account. 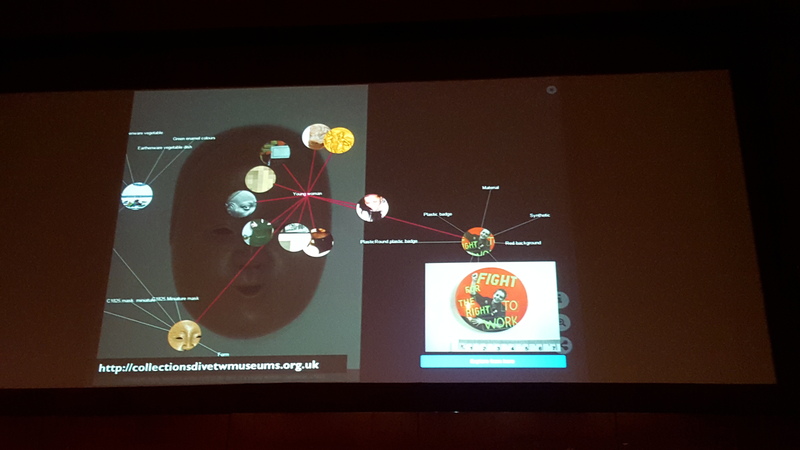 Interesting to hear about organisational resistance, like the sudden suggestion that the account for this project should be managed by curators rather than social media officers, and that museums should moderate their images on other feeds; interesting how something innovative can throw up these issues. But after some teething problems it was a success, getting kudos, press coverage, and increasing followers for all the museums. Also a great talk from Mark Pajak from Bristol Museums on the Trails and tribulations of digital signage – great to hear about the challenges, there are clearly a lot of variables to consider, but clearly a success for Bristol, and it’s on GitHub, yay! There was also a great talk from Katherine Biggs from Historic Royal Palaces on taking the palace to distant audiences via a high-res 3D projection in a dome in Cheshire. Katherine shared the effort the learning team went to to make the experience interactive, which was highly successful with engaging audiences, but turned out to distract from the detailed scan of palace. Kath shared thoughts on what they would do differently to make the palace the star of the show. Following lunch, which always includes the AGM, we had a keynote from John Coburn, Digital Programmes Manager at Tyne and Wear Archives & Museums, Finding space for the experiment: digital collaborations and their influence on the museum. Based at the Discovery Museum in a digital team of two, they collaborate with colleagues across the organisation on digital projects, and work to break down the idea of digital as some kind of separate area of work, but rather establish it as another dimension of museums fulfilling their core mission. John shared some examples of collaborative digital projects he has worked on. He spoke about their R&D project to produce a visual and thematic search collections interface that surfaces content based on user behaviour rather than using a search box. John shared details of TNT (Try New Things) which is basically a forum to bring together colleagues from across the museum, and offer modest funding for proof of concept projects. In this way they are trying to change organisational behaviour and culture, allowing people across the organisation to experiment and innovate. The afternoon offered two sessions, Connecting Organisations, so collaborations, the challenges and the pay offs, and Connecting Learners, so digital in terms of schools and life long learners. I enjoyed Raphael Chanay‘s talk on MuseomixUK, an exciting, if a little intense, approach to bringing new ideas into museums. An outlier was a talk from Fiona Talbott of the Heritage Lottery Fund on Are heritage organisations embracing digital? 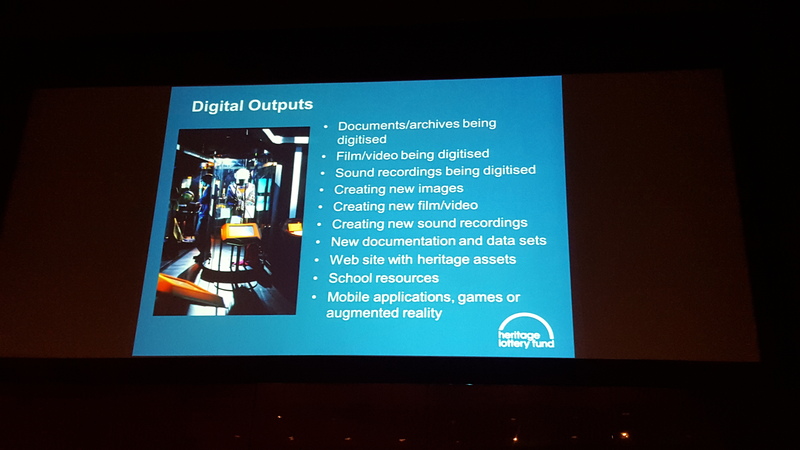 The state of digital in Heritage Lottery Funded projects. 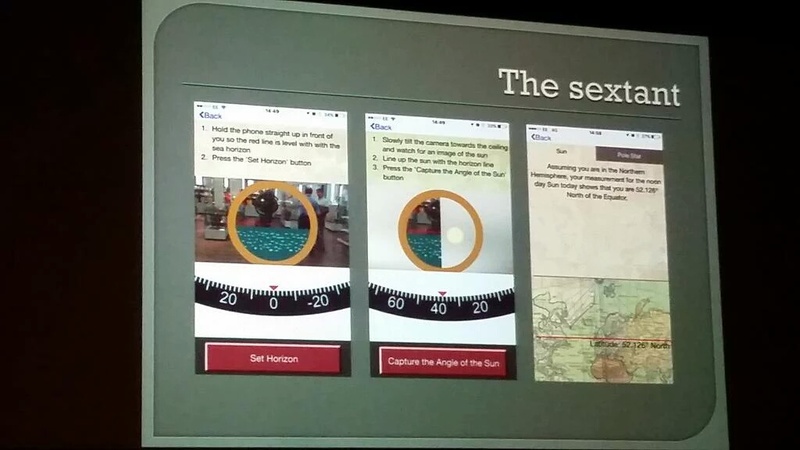 She shared the findings of a recent survey of HLF digital projects, and they were disappointing. Fiona said the study found a lack of forward planning, failure to build skills (with digital skills generally being bought in), and failure to address key issues in usability (single click through to social media, appropriate size assets for mobile, etc.). Discussions showed mixed feelings to her provocation, but she certainly threw down the challenge for the sector. 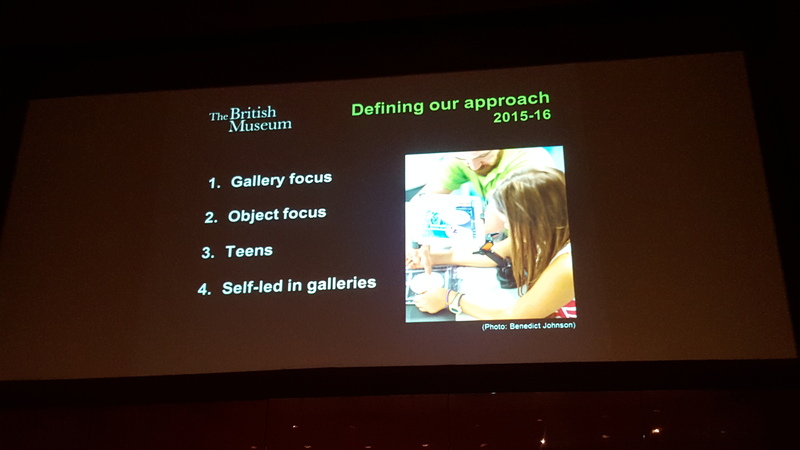 Juno Rae from the British Museums spoke about New digital learning initiatives for family and teen visitors at the British Museum. Juno and her co-education manager in the Samsung Digital Discovery Centre, Lizzie Edwards reviewed their weekend offer for teen and family audiences. They wanted to review the sessions to ensure that they were both gallery and object focused, that, despite not being formal school visits, related to and supporting the curriculum and focused on the IT skills offered, and that there is an increasing amount of support for self-led visits. 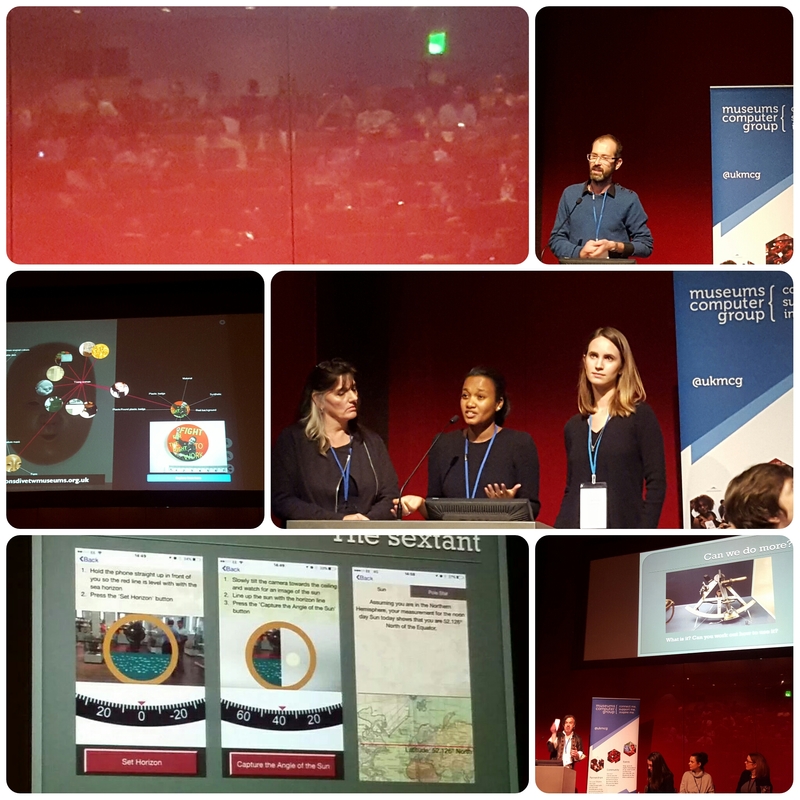 Another highlight of the afternoon was a talk from Rebecca Sinker, Natasha Bonnelame and Camilleri Gajewski about Tate, Khan Academy and the pathways to digital learning. They look at the question of what digital has to offer in the learning space over other platforms – why use digital in the first place? Approached by Khan Academy to use their MOOC platform, they undertook the challenge. Tate produces a lot of content, but a lot of it is for exhibitions and so is time limited. They looked at if and how this content could be re-purposed, how it would transform, the impact of placing it in a third party website, if and how visitors to Khan travel back to the Tate website and what those user journeys look like. The conference finished with a panel of brave attendees agreeing to share their take always from the conference to help us all solidify our ideas, followed of course by a Drinking About Museums! This entry was posted on October 26, 2015 by Jessica Suess in Museums.